REA Group, owner of Realestate.com.au FY16 results dissapointed the market. REA share price sold off post results as the market were expecting even strong results. One could say the stock price was priced to perfection. The high expectation is on the back of the iProperty Group acquisition made during the year. We see the company will struggle to meet the exceedingly high expectation as the tailwind of the low interest rate wanes. From the underlying market perspective, our Melbourne property market forecast is similar to Sydney and Brisbane where the market is stretched and that the current chase for yield will end badly. REA has been leveraged to the real estate market through its listing website but specifically the major driver of growth has been the advertisement for development projects. This made the underlying earning of the business to be extremely pro cyclical where during good times earnings will be boosted by developer advertisements but during periods of market slowdown, earnings would be exacerbated by lack of new projects. Its Asian real estate portfolio is instill in its infancy. The run way is still too long for it to offset any potential slowdown in Australia property market listing. 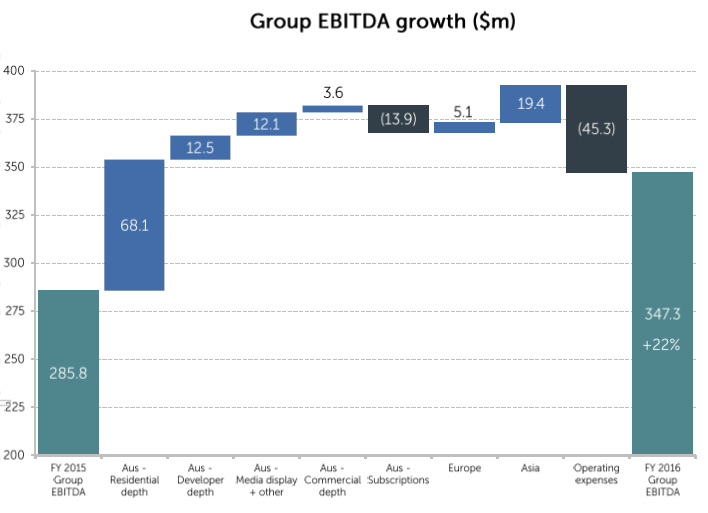 The breakdown of the current EBITDA shows the scale of the current Asia expansion relative to broader group earnings. We see the Asian portfolio as the next cycle story. The story is not broken yet for the stock. Whist our portfolio is fully invested we will be keeping an eye on ASX REA and looking to open a short position once a catalyst has been defined. The catalyst will be basically an event that shows the cycle has turned and we will chase from there.